Hustler Billiards is London's favourite place to play, relax and have fun. 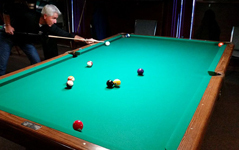 We are a licensed billiards hall with 12 -'4½x9' first-class billiard tables as well as 5 -'3½x7' coin operated tables. 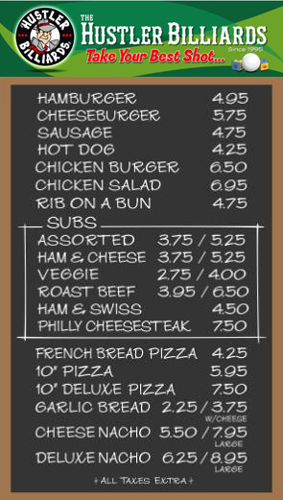 Hustler Billiards has rules and regulations, including a dress code and a code of conduct both of which are in effect at all times. Our clientele includes men and women. Our approach is all about "good times, good friends" and our customers include a diversified group of professionals, labourers, students and retirees. Hustler Billiards Association (HBA) is home to the largest in-house 8-ball pool league in North America. As such, table availability is limited in the evenings (Monday thru Thursday) from September through April. In 1994, a young man had a dream. Well, he wasn't really a young man anymore, more like middle aged. And it wasn't really his dream; it was actually a suggestion from his daughter. She suggested he open a pool hall. And as he thought about it, he realized it was a good idea. So a short, curly headed, slightly balding, middle-aged Italian decided to follow his daughter's suggestion. However, he didn't want to open a pseudo upscale hall like several in the city at the time and he certainly didn't want to open a pool hall like the ones where many of us older guys probably learned to play. He wanted to open a simpler place; a place where everyone could feel comfortable and could play the game at their level; a place where you could have fun and where everyone, well, almost everyone, knew your name; a place where the bartender could sing Happy Birthday to a patron, badly and off key; a place where practical jokes could be played without anyone getting too upset; a place where Newfies could rant and roar and nobody really paid any attention; a place where a short, unique guy named Pecker could become League President. But, most of all, a place where sportsmanship and fair play came first. 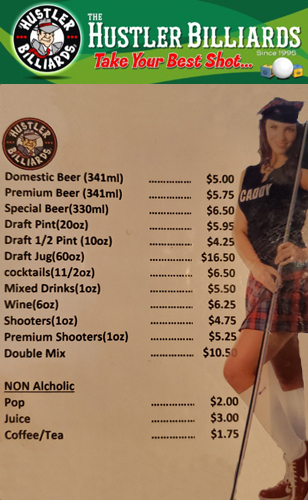 In January, 1995, Hustler Billiards opened its doors and, as they say, "the rest is history!" So please come and join Ernie, Kay and the staff at Hustler Billiards!